There will be a terrible reckoning . . .
England is at war with Spain, and Queen Elizabeth's court is torn apart by brutal rivalries among ambitious young courtiers. The inimitable investigator John Shakespeare is dragged from retirement to work for the Earl of Essex, the queen's favorite. His mission is to unravel the mystery behind the doomed Roanoke colony in North America, but instead, he uncovers a plot to kill the aging queen. With a plague devastating the country, Catholics being tortured, and John's wife keeping secrets from him, Shakespeare has his own survival to secure. 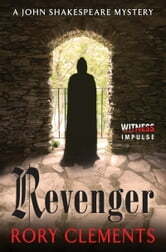 Filled with colorful historical detail, Revenger is a stunning novel of savage betrayals and salacious intrigue.